There’s a lot planned for you on your Smoky Mountains tour to Newfound Gap. Before your adrenaline charged 4x4 off-road adventure, you'll depart in an iconic, open-air Pink® Jeep® Wrangler from of our convenient Pigeon Forge, TN, location. From there, Sugarlands Visitor Center is your first stop. You’ll learn the history of the towns we pass along the way. From Sugarlands Visitor Center, you'll ascend 3,000 feet on paved roads. You’ll pass through a mixed forest made up of a mix of trees and smells that mimic that of the boreal forests that form a ring just south of the Artic Circle. 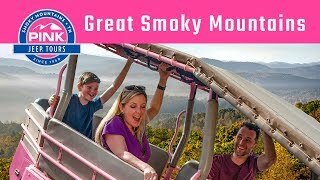 Discover how the Smokies got their name, stop for amazing photo opportunities and hear more of local geology and history. You’ll arrive at Newfound Gap, which is nearly 1 mile above sea level. You’ll see part of the mighty Appalachian Trail. Rockefeller Memorial is where U.S. President Franklin D. Roosevelt stood to dedicate the Great Smoky Mountains National Park on Sept. 2, 1940. A short nature walk brings yet more discoveries. The return trip from Newfound Gap includes stops for more photos. You’ll see the streams that ultimately feed the Gulf of Mexico via the mighty Mississippi River. Your tour finishes with a hand-gripping, off-roading ride through a trail on private land. Your professional tour guide has been expertly trained to give you an experience unlike any other in the Great Smoky Mountains. After your thrilling 4x4 ride, you’ll be dropped off in time for your next planned activity, but not before filling your memory—and camera—with stories and pictures to share.